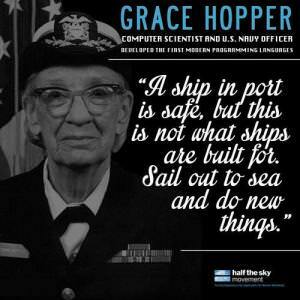 Happy Birthday to Tech Genius, 'Amazing Grace' Hopper! Amazing Grace, how sweet your tech skills! Today would have marked the 107th birthday of computer scientist and math whiz Grace Hopper (1906-1992), founder of one of the original programming languages, and U.S. Navy rear admiral. Hopper, often referred to as "Amazing Grace" or "the first lady of software," was so important to the Navy as a computer scientist that she stayed employed long after the standard retirement age of 62--remaining in service until her death at age 85. She was an invaluable asset, a tech pioneer, and a bold, independent personality who continues to serve as a role model for girls (and boys) in STEM. As a kid, Hopper reportedly dismantled all the alarm clocks in her house, determined to figure out the mechanics. Naturally, she went on to receive her bachelor's in Math and Physics from Vassar College, and attained her master's from Yale. Did you know iD Tech offers summer computer camps at Yale and Vassar? Image courtesy of Half the Sky Movement.